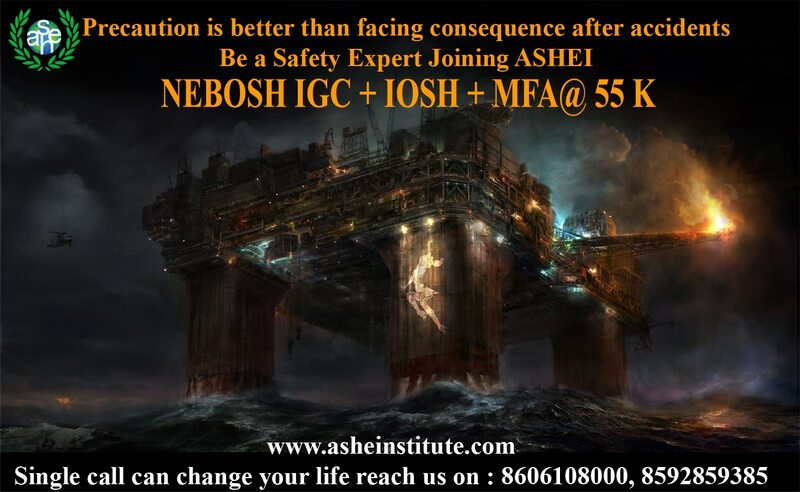 ASHE Institute- Environment Health & Safety training We are committed to Occupational Health and Safety training. We create safety Professionals. Join us, Our courses are the ideal way of building knowledge and skills in safety and health. HSW 3 Days course Its a level 2 examination of NEBOSH. Exam conducted by NEBOSH at our institute, next exam date commencing on Oct 9 IOSH (MS) 4 Days course Introduces managerial level professionals to effective management of safety and health at workplace, last day of the course you have to write an exam NEBOSH IGC 10 Days course + 2 days mock exam + 2 days exam Internationally valid NEBOSH certifications to practice and communicate effective health and safety culture. You have to register 1 month before the exam date and the registration fee is 20000rs. CIEH 1 Day training programme Exam mode : Objective (Multiple choice) 3 papers · Risk Assessment · Fire safety principle · Environmental award Each paper have separate classes and exams, Finally you get 3 certificates IADC Rigpass 3 Days End of the training you have descriptive type exam. Finally you get certificate and a card. HSW 3 Days course Its a level 2 examination of NEBOSH. Exam conducted by NEBOSH at our institute, next exam date commencing on Oct 9 IOSH (MS) 4 Days course Introduces managerial level professionals to effective management of safety and health at workplace, last day of the course you have to write an exam NEBOSH IGC 10 Days course + 2 days mock exam + 2 days exam Internationally valid NEBOSH certifications to practice and communicate effective health and safety culture. You have to register 1 month before the exam date and the registration fee is 20000rs. CIEH 1 Day training programme Exam mode : Objective (Multiple choice) 3 papers · Risk Assessment · Fire safety principle · Environmental award Each paper have separate classes and exams, Finally you get 3 certificates IADC Rigpass 3 Days End of the training you have descriptive type exam. Finally you get certificate and a card.